In her cookbook Fiesta!, Anya von Bremzen included a recipe by the Jackson Heights (Queens, New York) "arepa lady," known simply as Piedad. Though arepas are a common South American breakfast item (as well as a lunch and dinner starch), what makes hers so special is the luxurious inclusion of butter in the dough and the use of milk instead of water. Similar to an English muffins but made from precooked corn flour. It is cornmeal patty or pancake that is considered like bread in other countries. Arepas are popular throughout South America, but especially popular in Colombian and Venezuelan. It is considered the national dish of Venezuela (the local equivalent of an American hamburger). You can also find them all over Miami, Florida (the traditional arepa served in Miami has two ornmeal pancakes with a layer of cheese inside.) It is a bread that you can eat anytime, everywhere and with whatever you want. You can find arepas in small restaurants called areperas. The most famous is La reina pepiada, an arepa made with chopped meat, avocado and cheese. The favorite way to serve them in Venezuela is to split them open, remove some of the steaming moist corn meal, and then stuff them with your favorite ingredients. The arepa is wrapped in a square of slick paper (like butcher paper), and handed to the purchaser to eat standing up. The traditional arepas served in Miami has two cornmeal pancakes with a layer of cheese inside. Very few people make arepas at home, choosing to buy them at the store or have them delivered directly to their homes. They were first made by the Indians of Columbia and Venezuela as an important part of their diet. Just like corn tortillas were to the Aztecs. For many centuries, it was considered a food for the poor. Today they are considered a comfort food for everyone. 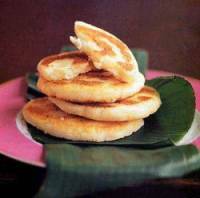 Originally, in the beginning of the 20th century, the masa for the arepas was prepared using a "pilón". "Pilar" was an arduous activity, which consisted of hitting the corn inside a hallowed tree trunk or "pilón" to remove its heart and skin. It was then boiled until soft and ground on a large concave stone. After a soft dough was prepared, condiments were added. The dough was shaped by hand forming arepas to look like round cakes and then baked over hot charcoals. Today, with corn flour so easily available, arepas are easy to make. Emenus.ca is your restaurant solution on the Internet. We are Canada's newest dining guide and restaurant web service. Bring milk to a simmer in a small saucepan, then remove from heat and stir in butter. Combine arepa flour, salt, sugar, and mozzarella in a large bowl. Add hot milk and stir until combined. Let mixture stand until milk is absorbed enough for a soft dough to form, 1 to 2 minutes (dough will continue to stiffen). Form dough into 12 balls (about 2 inches in diameter) and flatten between palms into 3 1/2- to 4-inch patties (about 1/3 inch thick). Heat 1 tablespoon oil in a large nonstick skillet over moderately low heat until hot, then cook 3 or 4 arepas until cooked through and golden in patches, 6 to 8 minutes on each side. Make more arepas in same manner, adding oil as needed. Arepa flour may be found in some Hispanic markets or grocery stores.